Of course it is just about impossible to improve on the passion and gospel power of Sam & Dave in their vintage years. But the Stax house writer's material they worked with is so strong that some people did try to cover them. 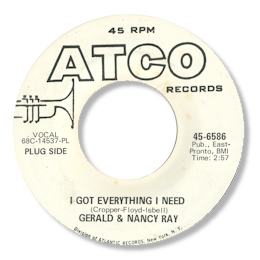 Gerald & Nancy Ray’s version of I Got Everything I Need is different enough – and has enough bite to it – that it is easily my second favourite cut to this wonderful deep soul item. The organ fills are very well judged as are the lovely horn charts. And while Gerald can’t really get close to Sam Moore he is reliable, honest and totally committed. Bass player Carole Kaye has said she played on the session so I guess it must have been held on the West Coast. "Ahmet Ertegün discovered Me in a night club called "The Scene" on Sunset in Hollywood Calif. He was in town recording some stuff with Bobby Darin and stopped by the club for a drink. 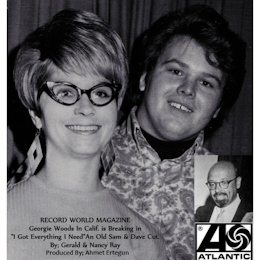 I had a female bass player at that time Nancy (she was my wife). Ahmet was amazed at the sound we had for a trio. And offered to sign us that night. Yes the basic tracks were done at Sunset Studios in Hollywood, myself Gerald Ray, Nancy Ray, Wayne Edwards, Earl Palmer and Carol Kaye were on that session.Then Ahmet took the tracks to New York, As for the organ sound you hear it was NOT an organ, but Steve Cropper playing guitar through a Leslie tone Cabinet. The horns of course was a made up of some of the group of the Bar-Kays - I know Otis Redding's used them a lot. Anyway a lot of the story you can find on my web site here. I don't have any copies of the record that I want to get rid of..they are always selling them on Ebay I know that. I'm actually out of retirement and have a new CD coming out in Sept this year and will also be doing tour dates. Yes you're right about the vocal in "I Got Everything I Need" kinda week, but man I was like 17 years old at that time. Been through a lot since then." Love the part about Steve Cropper's playing! And of course I'll watch out for Gerald's new CD - I'll put the details here when it's released. Can't thank Mr Ray enough for getting in touch.